I love horse racing movies. Secretariat was no exception. I thoroughly enjoyed the movie. It was very exciting to watch even though you know that he wins. Secretariat is about the legendary racehorse who won the Triple Crown in 1973. It revolves around Penny Tweedy and her horse Big Red known as Secretariat in the races. After her parents passes away, she is faced with a 6 million dollar debt in inheritance taxes for her parents farm. Hope springs the colt Big Red who quickly demostrates his amazing ability to win races. Even then Mrs Tweedy is faced with skeptics and pompous opponents in a male dominated sport of horse racing but she never loses faith in Secretariat or herself. This movie tells us that sometimes you have to stick with what you believe in. 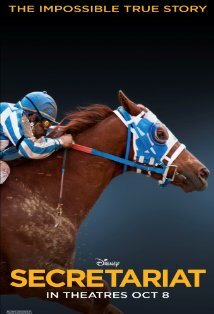 Secretariat opens in theatres Friday October 8.